Confessions of a Fashion Fanatic: Nooooooo! Top Ten Things About My Trip To L.A. The Gilt Group was selling Doo.Ri's draped jersey vest in black for a mere $223, but it sold out. I remember the first time seeing this vest...it was in a deep green shade and I loved it right away. I'm Lovin' it: My new iPhone!! 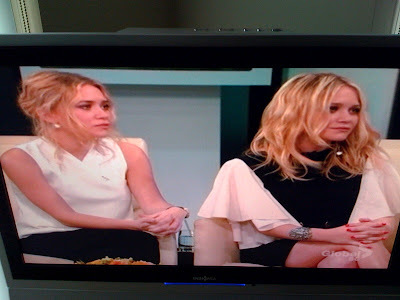 And Mary Kate and Ashley Olsen are on Oprah today, talking about their new hardcover book Influence. So watching it. Here's a pic from said new iPhone! FYI, that's Ashley on the left, Mary Kate on the right. I'm Over it: Eh, I'm in good spirits today. Track of the Day: Did I shout out "Missed The Boat" by Modest Mouse already?